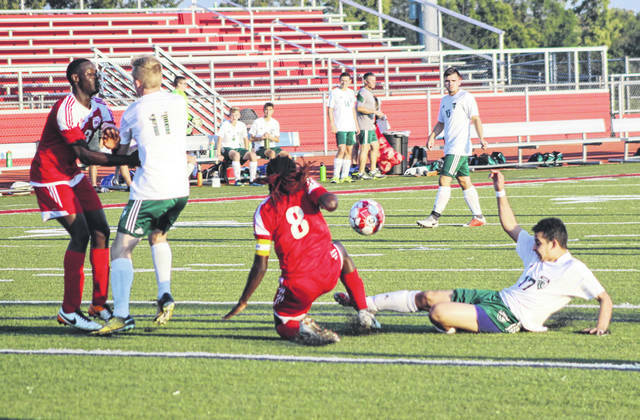 Jorge Guaderrama (17) goes in for a sliding kick during the first half of Greenville’s 11-0 win at Trotwood-Madison on Tuesday night. Guaderrama had one goal in the win for the Green Wave. Alex Hutt looks to get around a Trotwood-Madison defender during first half action of Greenville’s 11-0 win over the host Rams. Hutt scored five goals and had one assist in the win for GHS. 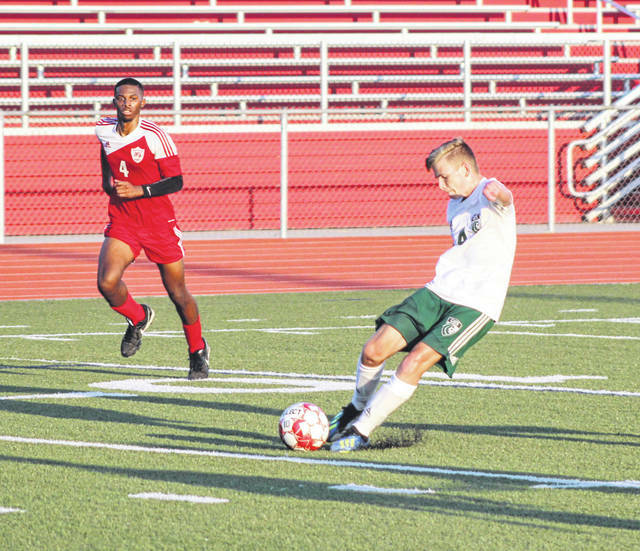 Ben Davidson takes a shot and scores his only goal of the game on Tuesday as Greenville defeated host Trotwood-Madison 11-0. Davidson also had one assist in the win. Dylan Snyder (10) gives chase on the ball as the Trotwood-Madison goalkeeper scoops it up denying the goal attempt. Greenville won the game 11-0 for its first win of the season. 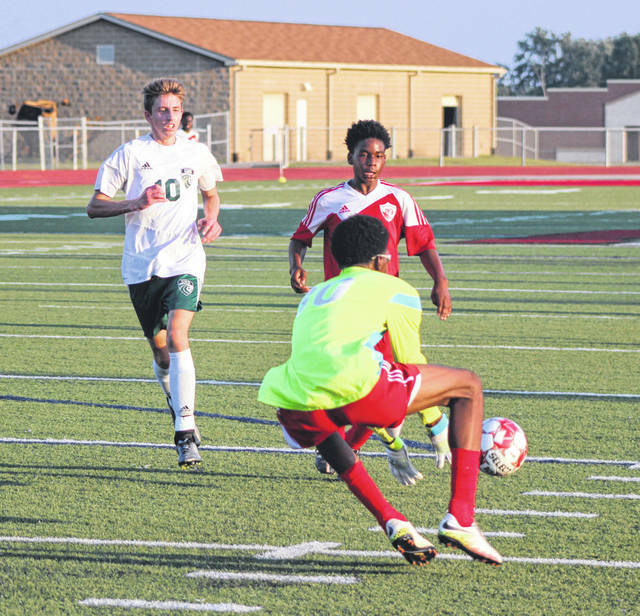 TROTWOOD – After losing its first two games of the season, the Greenville boys soccer team earned its first win with an 11-0 shutout Tuesday night over host Trotwood-Madison. Head coach Mark Coppess is hoping it will be the confidence boost his team needs. The next four are at home for the Green Wave with West Carrollton (today), St. Paris Graham (Saturday), Xenia (Sept. 4) and Celina (Sept. 8). Then Greenville goes on the road for two at Fairborn (Sept. 11) and Troy (Sept. 13). Greenville’s season began with back-to-back losses to Stebbins (4-1) and Shawnee (2-0). 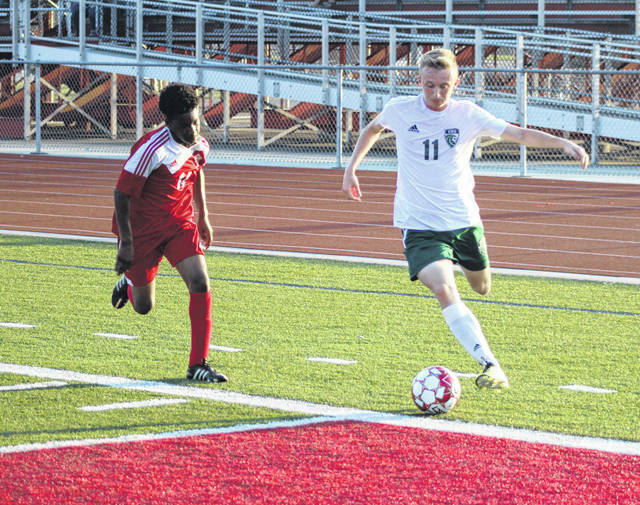 Junior forward Alex Hutt led the Green Wave with five goals against the Rams. Dylan Snyder and Clayton Herron each had two goals and Jorge Guaderrama and Ben Davidson each had one goal in the win. Snyder also had a pair of assists, while Herron, Davidson and Hutt each had one assist. Jacob Maher also had an assist and also had one save in goal giving him seven saves for the season. The Jets won three straight games to take the overall match win against Bradford on Tuesday night. FM won 25-12, 25-16 and 25-7. Individual match details were not immediately available. The win improves Franklin-Monroe to 3-1 overall and 1-0 in the Cross County Conference. The Jets travel down the road today to rival Arcanum for a big CCC rivalry game. Ansonia needed four games to beat National Trail on Tuesday. The Lady Tigers lost the first set 21-25, but then won three straight 29-27, 25-13, 25-20 to capture the Cross County Conference victory. Freshman Kenzie Singer had 7 aces and 7 kills to lead Ansonia. Also contributing to the win were seniors Kassy Wentworth, Emily Gariety, Chelsea Noggler and Trinity Henderson. Wentworth had 5 aces and 4 kills, Gariety had 2 aces, 18 digs and 1 kill, Noggler had 1 ace and 4 kills and Henderson had 38 digs. The win moved Ansonia to 1-0 in conference play. Greenville lost a close one on the road at Twin Base Golf Course on Tuesday. Wayne edged the Green Wave by two strokes, 185-187. Warren Hartzell was the top scorer for GHS with a 45. He was followed by Andrew Kiryluk with a 46 and Evan Saylor and Jack Marchal each carded 48s. Also competing for Greenville was Alex Kolb (52) and Bryan Day (56). Greenville’s record is now 1-3. Carter Gray shot a 42 to earn medalist honors in leading Arcanum to a dual match win over Bethel on Tuesday at Creekside Golf Course. Also contributing to the team score for the Trojans was Cade Brubaker with a 45, Jack Shannon with a 46 and Kendall Wright with a 47. Evan Atchley (50) and Trevor Bailey (53) also competed for Arcanum. Lexi Unger earned match medalist honors after shooting a 46 on the back nine on Tuesday at Beechwood Golf Course to lead the Lady Trojans to a win over Bethel. Also contributing to Arcanum’s team score of 234 was Maddy Wogoman with a 60, Araya Musselman with a 63 and Sydney Artz with a 65. Madison Mankin (66) and Elliana Sloan (69) also competed in the match. Olivia Riettinger was the top Bethel scorer with a 57. 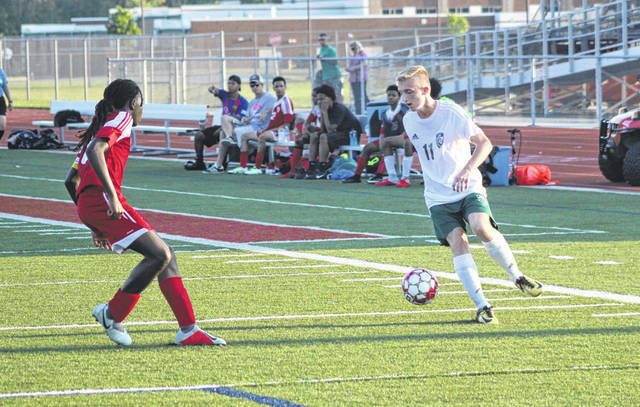 This entry was tagged Alex Hutt, boys soccer, Greenville Green Wave, Mark Coppess. Bookmark the permalink.